In the automotive industry, EV news is front-page news every day. Battery-powered electric vehicles continue to be under development with the occasional release. Yet, EV adoption is still slow, with less than 2 percent of new vehicle sales comprised of electric models. It’s important to note, however, that EV adoption is taking off like never before. In the past months, there have been big developments, both in news and with model releases, in the EV industry. And make no mistake – carmakers and legislators are continuously putting on the full court press with electric cars. Tesla has announced that they’ve struck a deal to produce EVs in China. A manufacturing plant will be built in Shanghai province and is expected to produce up to 500,000 units per year. It’s currently planned to be the only plant aside from the home base in California, and in a country that’s a hotbed for electric vehicles. But the new factory isn’t the only news from the most prominent – but not the best-selling – EV maker in the world. Achieving the target of 5,000 Model 3’s per week has been nearly impossible to achieve, requiring a tent erected on site for an added production line. Elon Musk’s company continues to burn through cash at an alarming rate, losing $785 million in the first quarter of 2018 alone. Jaguar has just released a high-performance all-electric SUV, the Jaguar I-PACE. After a long courting period, the I-PACE arrived on the market with virtually none of the problems that plague other EV carmakers – at least, not publicly. The Jaguar I-PACE uses two electric motors to produce 394 horsepower and 512 lb.-ft. of torque for an All-Wheel Drive system and 0 to 60 acceleration in 4.5 seconds. A 90-kWh battery allows for 240 miles of range. A completely redesigned and retooled Nissan LEAF arrived in showrooms at the beginning of 2018. What was already the best-selling electric car in the world made significant improvements all around. First, its looks are remarkably better than its bubbly old body. Second, the performance has been improved with a 147hp electric motor. Third, it’s range is far better using a 40kWh Li-Ion battery for up to 151 miles on a single charge. 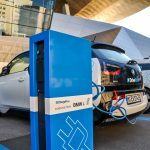 One of the automakers with great intentions in the EV market, Volkswagen, announced plans to roll out their new MEB platform in North America by 2020. It’s their platform for compact electric cars and SUVs. The new platform, according to VW Group, aims to “consolidate electronic controls and reduce the number of microprocessors, advance the application of new driver-assistance technology and somewhat alter the way cars are built”. In the early stages right now, the MEB platform would see the production of VW’s I.D. series of vehicles built. It includes the Volkswagen I.D. hatch, the I.D. Crozz electric car, and the I.D. Buzz minivan. From the VW Group also, the Audi e-tron Quattro is finally coming to production. Concepts have been floated for years, but it will be coming soon. The Audi e-tron will come with a 95kWh battery for acceleration as fast as 4.6 seconds to 60mph. It’s capable of 150kW high-speed charging and will be equipped with an all-new electric quattro all-wheel-drive system. Expect that the Audi e-tron Quattro will be one of the pricier premium electric vehicles on the market, appearing to be similar in size and equipment to the Audi Q7 SUV. A more cost-effective BEV compact SUV is set to be in stores this fall. The Hyundai Kona is already a popular compact SUV for the Korean automaker, and the Kona Electric will provide an extra level of attraction when it comes out later this year. It’s powered by a 64kWh Li-Ion battery and a 201-hp electric motor. It’s rated to achieve up to 250 miles on a charge, so it’s not just a city car. With impressive tech, it’s equipped as a top trim level for Hyundai. For hypercar lovers, Rimac has announced the development of the Rimac Concept Two. It’s a pure electric beast with 1,914 horsepower – no, that’s not a typo. Acceleration from 0 to 60mph is mind-blowing at 1.85 seconds, and it has a top speed of 258 miles per hour. A carbon fiber monocoque, integrated 120kW battery pack, and new butterfly doors are just a few of its design features. Meant for the innovative driver, the Rimac Concept Two will be an extremely limited-production concept vehicle. Rimac also made news recently when Porsche acquired a 10 percent stake in the company. The purpose is to share electric vehicle technology to develop their own stable of EVs. As EV adoption continues to rise, there is sure to be a lot of exciting news to come. Jason Unrau is a freelance automotive writer with more than 15 years of experience in the retail automotive environment. He has a passion for automotive technology, is a GM Certified Technology Expert, and loves to drive.